A few weeks back we wrote a post on Object detection using YOLOv3. The output of an object detector is an array of bounding boxes around objects detected in the image or video frame, but we do not get any clue about the shape of the object inside the bounding box. Wouldn’t it be cool if we could find a binary mask containing the object instead of just the bounding box? In this post, we will learn how to do just that. We will show how to use a Convolutional Neural Network (CNN) model called Mask-RCNN (Region based Convolutional Neural Network) for object detection and segmentation. Using Mask-RCNN we not only detect the object, we also obtain a greyscale or binary mask containing the object. The results in this tutorial are obtained using a Mac OS 2.5 GHz Intel Core i7 CPU. The inference time is from 350 ms to 2 seconds per frame on the CPU, depending on the complexity and number of objects in the frame. Mask-RCNN was initially introduced in Nov 2017 by Facebook’s AI Research team using Python and Caffe2. It was later ported to Tensorflow and several pre-trained models with different backbone architectures like InceptionV2, ResNet50, ResNet101, and Inception-ResnetV2 were shared in the Object Detection Model Zoo. They also provide you tools to train your own models. The Inception backbone is the fastest of the four. You can even try it on a CPU in a reasonable time and therefore we have chosen it for this tutorial. This model was trained on MSCOCO dataset. We will share OpenCV code to load and use the model in both C++ and Python. The minimum required version of OpenCV is 3.4.3. Before we dive into the code, it is worth understanding a few terms especially if you are a beginner. In computer vision, the term “image segmentation” or simply “segmentation” means dividing the image into groups of pixels based on some criteria. You can do this grouping based on color, texture, or some other criteria that you have decided. These groups are sometimes also called super-pixels. In instance segmentation the goal is to detect specific objects in an image and create a mask around the object of interest. Instance segmentation can also be thought as object detection where the output is a mask instead of just a bounding box. Unlike semantic segmentation, which tries to categorize each pixel in the image, instance segmentation does not aim to label every pixel in the image. Below we see an example of instance segmentation of two sheep on a very similar colored background. Mask-RCNN is a result of a series of improvements over the original R-CNN paper (by R. Girshick et. al., CVPR 2014) for object detection. R-CNN generated region proposals based on selective search and then processed each proposed region, one at time, using Convolutional Networks to output an object label and its bounding box. Fast R-CNN ( R. Girshik, ICCV 2015) made the R-CNN algorithm much faster by processing all the proposed regions together in their CNN using a ROIPool layer. Faster R-CNN (S. Run et al., PAMI, 2017 ) pushed it even further by performing the region proposal step too using a ConvNet called Region Proposal Network(RPN). Both the RPN, and the classification and bounding box prediction network worked on common feature maps, thus making inference faster. On a GPU, Faster R-CNN could run at 5 fps. Mask R-CNN (He et al., ICCV 2017) is an improvement over Faster RCNN by including a mask predicting branch parallel to the class label and bounding box prediction branch as shown in the image below. It adds only a small overhead to the Faster R-CNN network and hence can still run at 5 fps on a GPU. In this tutorial we show results by running on a Mac OS 2.5 GHz Intel Core i7 CPU and it takes around 2 seconds per frame on the CPU, even for the frames with more than 30 objects. The Mask-RCNN network has two major parts. The first one is the Region Proposal Network which generates around 300 region proposals per image. During training, each of these proposals (ROIs) go through the second part which is the object detection and mask prediction network, as shown above. Note that since the mask prediction branch runs in parallel to the label and box prediction branch, for each given ROI, the network predicts masks belonging to all the classes. During inference, the region proposals go through Non-Maximum Suppression and only the top scoring 100 detection boxes are processed by the mask prediction branch. So, with 100 ROIs and 90 object classes, the mask prediction part of the network outputs a 4D tensor of size 100x90x15x15, where each mask is of size 15×15. These masks can then be thresholded to get a completely binary mask. Like Faster-RCNN, the choice of the backbone architecture is flexible. We chose InceptionV2 because it is faster, but one could get better results with better architectures like ResNeXt-101, as pointed by the authors of the Mask R-CNN paper. Compared to other object detectors like YOLOv3, the network of Mask-RCNN runs on larger images. The network resizes the input images such that the smaller side is 800 pixels. Below we will go in detail the steps needed to get instance segmentation results. For simplicity and clarity of visualization, we use the same color to indicate objects of the same class in the above video, but we also show a minor code change to color different instances differently. Let us now see how to run Mask-RCNN using OpenCV. We will start by downloading the tensorflow model to the current Mask-RCNN working directory. After the download is complete we extract the model files. We will be using the frozen graph file frozen_inference_graph.pb to get the model weights. The Mask-RCNN algorithm produces the predicted detection outputs as the bounding boxes. Each bounding box is associated with a confidence score. All the boxes below the confidence threshold parameter are ignored for further processing. The object mask output from the network is a greyscale image. One could use it directly for alpha blending purposes, if needed. Since we use binary masks in this tutorial, we use the maskThreshold parameter to threshold the grey mask image. Lowering its value would result in a larger mask. Sometimes this helps include the parts missed near the boundaries, but at the same time, it might also include the background pixels at the more pointy boundary regions. The file mscoco_labels.names contains all the objects for which the model was trained. We read class names. Then we read and load the colors.txt file containing all the colors used to mask objects of various classes. frozen_inference_graph.pb : The pre-trained weights. mask_rcnn_inception_v2_coco_2018_01_28.pbtxt : The text graph file that has been tuned by the OpenCV’s DNN support group, so that the network can be loaded using OpenCV. We set the DNN backend to OpenCV here and the target to CPU. You could try setting the preferable target to cv.dnn.DNN_TARGET_OPENCL to run it on a GPU. But keep in mind that the DNN module in the current OpenCV version is tested only with Intel’s GPUs. After a frame is read from the input image or video stream, it is passed through the blobFromImage function to convert it to an input blob for the neural network. In this process, it takes in the input image frame in its original size and sets the swapRGB parameter to true. The blob is then passed in to the network as its input and a forward pass is run to get a list of predicted bounding boxes and the object masks from the output layers named as ‘detection_out_final‘ and ‘detection_masks‘ in the network. These boxes go through a post-processing step in order to filter out the ones with low confidence scores. We will go through the post-processing step in more detail in the next section. The inference time for each frame is printed out at the top left. The image with the final bounding boxes and the corresponding overlaid masks is then saved to the disk, either as an image for an image input or using a video writer for the input video stream or webcam. Now lets go into details of some of the postprocess function call used above. The network’s output masks object is a 4-dimensional object, where the first dimension represents the number of detected boxes in the frame, the second dimension represents the number of classes in the model and the third and fourth dimensions represent the mask shape(15×15) in our example. If the confidence of a box is less than the given threshold, the bounding box is dropped and not considered for further processing. Finally, we draw the boxes that were filtered through the post-processing step, on the input frame with their assigned class label and confidence scores. We also overlay the colored masks along with their contours inside the boxes. In this code, we used the same color for all the objects belonging to the same class, but you could color the different instances differently too. # Print a label of class. is this from opencv version ? which version we need to use ? I have OpenCV 3.4.0 so I need to upgrade ? Did you download the model in mask_rcnn_inception_v2_coco_2018_01_28 ? Not sure if that is just in the 4.0.0 pre-release version..Could you please try the 3.4.3 release version? That should be more stable. Hi, great work! Does the sample code can be run on Nvidia GTX10xx GPU? Thanks for the info. Dmitry Kurtaev (from Intel’s OpenCV team) mentioned that non-intel GPU support is flaky. There is a PR that will officially support non-intel GPUs but he was not sure about the performance. The bottomline is that Intel funds OpenCV development and so it does not have the incentive to make it good for an NVIDIA product which is a shame because if the GPU performance was as good, OpenCV could become a strong framework in the inference space. Actually there is a Vulkan backend (also from intel) waiting for a merge in the OpenCV master but it crashes my system (with anAMD GPU) in its current state. I am not surprised as this is just the very first commit for Vulkan support, but I think this could be the future as nVidia doesn’t really support OpenCL in favor of CUDA. As for the current OpenCL performance, I got a little bit worse results on a Vega64 than on an 8 core Ryzen and much worse results with an 1070. But on another machine the 1080Ti was able to beat the 4 core i7 in its own setup. There is also a difference between standalone images and videos. But these are just my preliminary tests, I will dive into it later. @andrskriston:disqus : You mentioned GPU performance was disappointing. How does it compare to CPU performance — 2x better? Great stuff and well done! I have retrained file trained using Inception-V3 model from tensorflow. The instructions on “load and model classes” says I need to input the training weighs file in .pb format and the graph-file in .pbtxt.file format. I think I already have the .pb file(which |I believe is what the training weights are), Please can you explain how I can obtain a .pbtxt file in order to use your code for my retrained model. The same page also gives a script for generating the text graph file when you have frozen graph and the .config file used for training. Dear Sunita, thank you for the very clear and useful article. Btw, Sri or Sunita, do you have any tutorial/article on how to train with our own dataset for Mask RCNN? That’s a good question, In fact I had the same query in my mind. I think this article provides a excellent step-by-step explanation for using a pre-trained model’s weights and associated data for the mask RCNN technique. If you would like to train your own data using RCNN approach, then you need the right dependencies (like matplotlib, numpy..etc), the annotations of the objects in a given image and the image data set. I am not sure, If someone has tried doing this Tensorflow -Python API but please find the link below that details the procedure for a RCNN based object classification for custom object detection using python. I found this useful and I will be trying to train the model with my own data set in next few days. Let me now how you get along with-it. If I am successful on getting my own data set work, I will share the detailed steps with you. Likewise, I would expect the same from you please. I have not succeeded with the custom object detection training. Thanks for the great article, at last I was able to use a mask-rcnn model in openCV! Thanks for reading and glad to know that you could run the model. I have not run it on a VPU yet, but would encourage other readers to give inputs if they have experience in that direction. Do YOLO an RCNN provide a variable with the total of detected objects? Do they provide some sort of string vector listing all the features of the detected objects? Yes, both of them have all those information.. You can see above in the post process function, we read the number of detected objects into the variable numDetections. Each detected object also has the confidence score, class id and the bounding box info. How can I solve them ? Anyways, I’d like to have more hands on the levers than just the confidence and mask thresholds. In particular, for the RPN, what is the best what to increase the ~300? 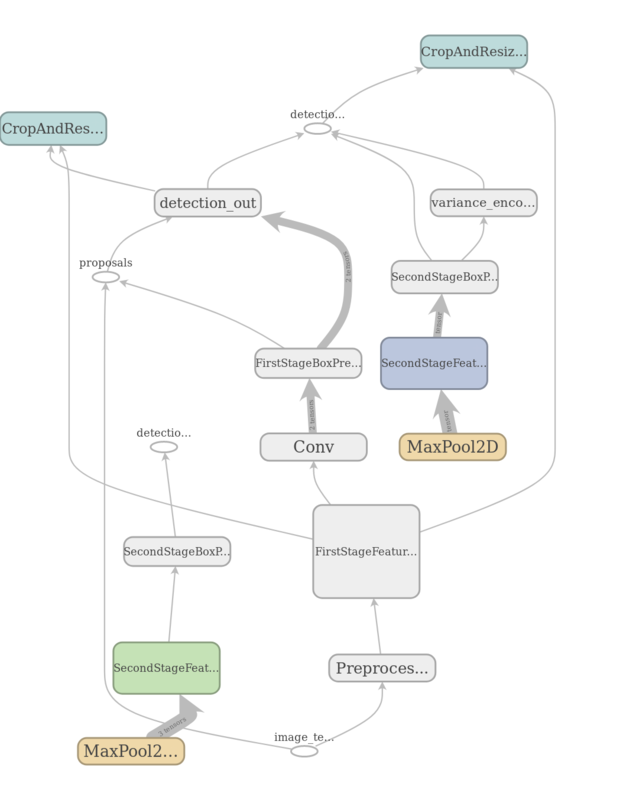 I found the “proposals” parts in mask_rcnn_inception_v2_coco_2018_01_28.pbtxt and was able to change some of those float values and saw some changes in the identification. Nothing too illuminating though. Is there guidance to changing these? e.g., based on image size etc? It depends on what you are trying to tune. Before processing further the network scales all images so that the shorter edge is 800 pixels. If you are missing objects from being detected, a better backbone architecture might be needed. You can try https://github.com/matterport/Mask_RCNN . it is a really nice article! Good job! I was able to use a pre-trained Mask RCNN Inception V2 Coco model with OpenCV 3.4.3 (C++ version). My problem is I cannot apply my own retrained model (trained on custom data set). The source code is the same and it is works with the pretrained model but not with my own trained one. The model graphs https://uploads.disquscdn.com/images/692eb041b066de349da65bfd31df2b899a8a17c2c6497bb4c6943867f5c13594.png https://uploads.disquscdn.com/images/3f2d5b3fe9a584acf43bd512d704ace8b4f93319309cc7cea6819a659ac6025a.png will be a bit different (I attached the images). Do you have any idea why the graphs are different? Could you share please your pipeline config? I have checked the shape of the blob (blob.shape = (1, 3, 480, 640)), and I believe that the blob is being generated correctly. Do you know what the problem is? How Can I close all of the classes/labels except car? Hello! Thanks for this article! It’s really cool! Could you help me please. How can I train my own dataset? I prefere to work on C++ and OpenCV. But I didn’t find any articles about training model in C++ and OpenCV. Mayby you have your “best tutorials” for Mask R-CNN training? Could you make a tutorial on how to develop our own model? thanks.